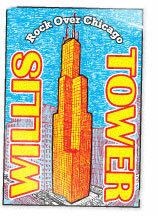 Formerly known as the Sears Tower, this skyscraper was until 1998 the world's tallest, at 1,454 feet and 110 stories. The stepped-back proﬁle is reminiscent of skyscrapers of the 1920s and is an engineering solution to the challenge of supporting such a tall tower. Nine separate structural sections are bound together to strengthen the center extending the full height of the building.